Last Friday night was the occasion for COPE Galway’s annual Sleep Out where 30 of the city’s business and community leaders spent 12 hours sleeping on the streets in a venture that has raised €110,000 to date for homelessness services. Earlier that afternoon, at the Fairgreen Hostel, I met COPE Galway CEO Jacquie Horan who talked with me about the homeless crisis and COPE’s other vital services for victims of domestic abuse, and older people. 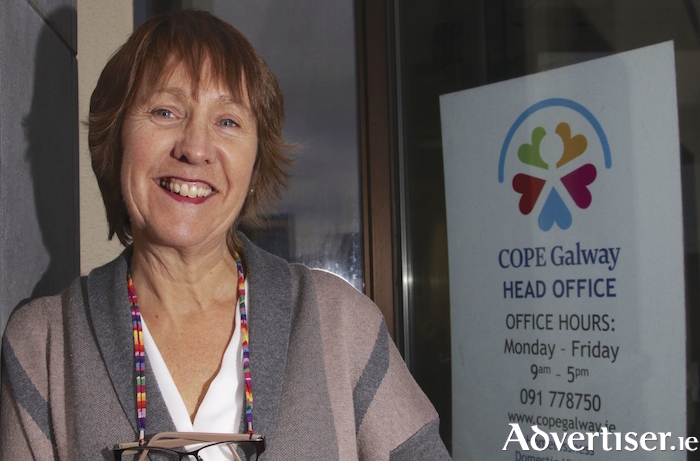 A native of Roscrea and a social scientist of wide experience, Horan has been in charge of COPE Galway since 1997. We began by talking about the city’s homeless crisis which has seen numbers of both ‘rough sleepers’ and homeless families rising steadily and substantially over each of the past four years. Horan outlines the issue of family homelessness; “Because of the shortage of housing people are falling into homelessness who never imagined it could happen to them. We’re getting calls on a daily basis from families who were holding down stable accommodation in the private rental sector for years; paying their rent, working and living a normal life. Then, for whatever reason, either the landlord decides to sell the property or the banks have repossessed it, they have to move out. I ask Jacquie can she see any hope of the homeless situation improving; “I believe Simon Coveney’s plan, Rebuilding Ireland, is a good one but we still aren’t seeing houses being built and, until that happens, things will get worse,” she declares. “Locally, I would like to see more resources being put into the Void Housing Strategy. It just seems wrong that when so many people need houses there are houses not being occupied. “Local authorities have been given some additional resources to identify properties that are void in their areas and to bring them back into occupation and I’d like to see more being made of that. I believe Galway is small enough and the goodwill exists that instead of having 45 families today living in a hotel room or B&B we could house them. The problem here is not as big as in Dublin, it’s manageable if we put our minds to it. Jacquie next switches her attention to domestic violence, another major social problem which COPE deals with on a daily basis. “Domestic violence still doesn’t get talked about openly enough,” she observes. “The level and intensity of it has increased over the last 10 years. A Europe-wide study from 2015 found that one in five women over age of 15 had experienced domestic abuse. We run our refuge in the city and one of our big projects is to deliver a new domestic violence refuge. “We try to inform and educate professionals who are coming in touch with a wide range of women and we have people who give staff training sessions to help them identify signs of abuse,” she continues. “We’ve produced a video for GPs to help them respond to women and this week we’re launching a support booklet produced by women who came through our services all about parenting in the context of domestic violence. It’s a wonderful booklet and highlights that there are parenting supports available. We have also been going out to schools and delivering programmes around healthy relationships to teenagers, and that’s really important and women who’ve been through our service have helped devise the content. So we are trying to address the whole societal issue around domestic violence and to inform and educate. “Meals on Wheels was one of our first services to start in the city. We have developed a really good quality Meals on Wheels service in our Ballybane facility; we are the only service in the country that has a ‘Q’ quality mark for our product. Over the last few years we’ve been noticing that about a third of our meals are modified meals – modified in texture because it needs to be chopped up or blended, or modified to suit specific dietary needs. “When we began our research we learned that some 25 per cent of baby food in supermarket is being bought for use by older people. We recently received a grant that will enable us to develop a business plan to explore the possibility of developing commercially available modified meals for old people and getting them into supermarkets or purchased online. We try to meet the needs of the older person who wants to stay living at home as long as possible.